"Almost as good as the movie by John Carpenter, an intensive action thriller set in the harsh climates of the Antarctic." 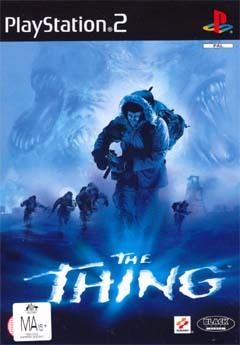 The Thing is the latest game from Vivendi Universal that is based on the cult movie The Thing. The storyline takes place right after where the movie ended, in the frozen wastelands of the Antarctic. The movie is based on an American scientific outpost that discovered an alien entity. Originally this entity was from the Norwegian base camp that shape changed into a dog. The Norwegians, who knew the true identity of the dog, tried to hunt the creature down but were unsuccessful and lost their lives in the process. The Americans who discovered the dog, unaware of its true nature befriended the animal when all of a sudden their lives were thrown into chaos. They eventually discover that this creature can shape change into anyone it comes in contact with and one by one, the scientists are killed. In order to save themselves and perhaps the world, the two remaining scientists blow up the entire camp. 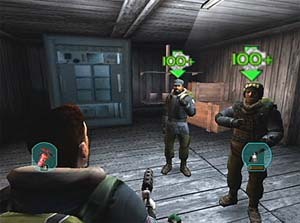 The game takes place a few hours after this event when an elite military rescue team are sent to investigate the carnage at the outpost. You play the role of Captain Blake who must discover what on earth is going on and to keep his squad from getting killed. 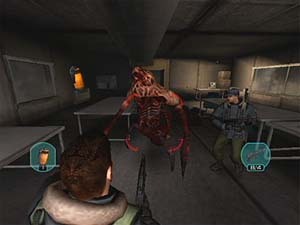 The gameplay of The Thing is a cross between an adventure game and a third person shooter. The game reminds me of the resident evil series but with a more interesting storyline behind it. Your squad is comprised of three other members that include a medic, engineer and a soldier. This is where the Squad-AI comes into play and can sometimes become frustrating. Apart from giving orders to your men such as repairing equipment, attacking or healing other members, you must also monitor their trust/fear system. For example, when you soon encounter the blood soaked walls or rooms filled with body parts, your squad slowly becomes scared. A variety of things (no pun intended) can happen when a squad member becomes scared, they can start talking to themselves, scream, shoot aimless at shadows, vomit and even wet themselves. The trust meter is a little trickier because it shows how much your squad trusts you and whether or not they think you are infected by the alien entity. In order to improve squad trust, you can give them ammo, perform a blood test with the hypodermic needle to prove that you are not infected or assist them in battle. The main problem with The Thing is the control system that is extremely difficult to master at the start of the game, it takes roughly a few hours of gameplay to get everything down pat. There are a variety of challenges that you must perform throughout the different levels in the game such as repairing computers or finding equipment to help you progress through the game. You will also meet NPC's who will either assist or deter you from your goal. Combat in the game is extremely fun, especially when you have two of your squad members firing away at the same creature. Early in the game, the aliens are small creatures like the face-huggers from the Alien movies but as you progress, they become bigger and deadlier. Graphically, The Thing is simple quite stunning on the PlayStation 2 and plays exceptionally smoother than the PC version. All characters have a high amount of polygons with detailed textures that look quite realistic. The alien creatures look quite bizarre and something straight out of a John Carpenter or Stephen King movie. The lighting effects in the game have been extremely well done and help with the games atmosphere. The attention to detail in the game is amazing, whether its the footprints in the snow that your team leaves or the Antarctic blizzard effects, everything is perfect. Just be warned though, this game contains an unusually high amount of realistic gore that will even shock the strongest of us. The game contains an unusually high amount of sound effects such as the moans and grunts of the alien creatures, the crunching of the snow as you walk through it and even the sounds of fluorescent lights that hum. The music in The Thing has been relegated to the background but helps add to the suspense and action of the game. All the character acting has been professionally done, especially when it comes to your squad losing their cool. The Thing is a great game but be warned though, you will need at least an hour or so to get into the game so make sure you give it a go. 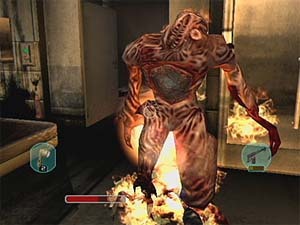 The game combines suspense, thriller and action as many of the games in the Resident Evil series did. Although the game is not based on the movie per se, make sure you check out the movie for some of John Carpenter's best work. Highly Recommended!